Dragon’s Blood ~ Protection, clears negativity, productivity. Frankincense ~ Protection, purification, spiritual awareness, an antidepressant. Benzoin ~ Purification, blessings, prosperity. Myrrh ~ Clearing, spiritual connection, healing. The best way to heat the charcoal disc is with kitchen tongs over a candle until it is burning. 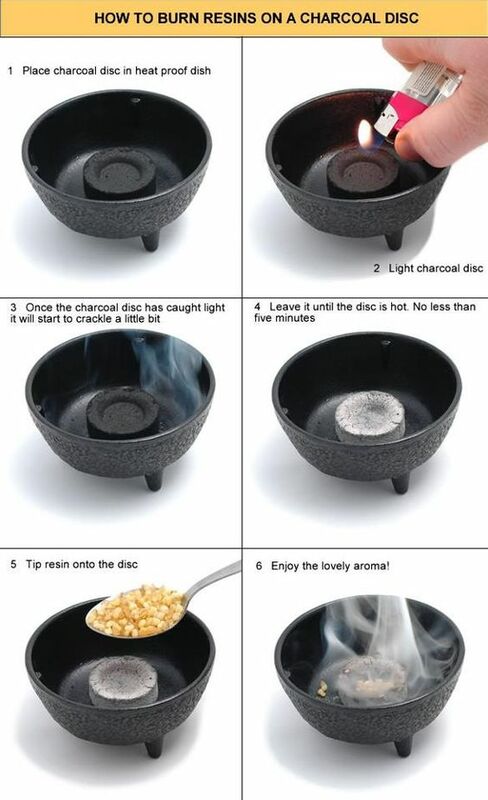 Place the charcoal disc inside a heat-resistant bowl and then add the four resin pieces into the heated charcoal disc. You will notice a pleasant smelling white smoke coming up and it is this white smoke that actually cleanses the negativity from your home. These resins work equally well on cars, furniture, clothing, books, rugs, jewellery, or a person. Good house preparation is essential for a positive outcome. Make sure clutter is kept to a minimum and that the rooms, walls, windows, and floors are clean and orderly. Open everything inside which are closed like internal doors, wardrobes, cupboards, drawers etc so the smoke can enter the space. To begin the cleansing process, start at the open front door with the smoking resins. Ask (Whatever your faith is) to help you rid the house of all negative energies and to bless the cleansed environment. Proceed to the first room on your left moving in a straight line lifting and lowering the smoking resin from ceiling to floor, enter the first room and continue clockwise around the room. Again moving in a straight line to every corner in each room, lifting and lowering the smoking resins from ceiling to floor. Work the smoke into any wardrobes etc, taking your time and being thorough. Once at the rooms doorway continue in a clockwise motion to the next room and repeat until the house has been completed and you are once again at the front door. Once at the front door tell the negative energies to leave the house through the open door allow the resin smoke to cover the door frame then step out onto the doorstep and place the smoking resins on the doorstep. Allow the resins to smoke for several minutes. Thank (Whatever your faith is) for helping you rid the house of all negative energies and to bless the cleansed environment and the people who reside within the house. Rock salt can be used to cleanse the property outside. Scatter it on the ground around the house. Lastly, make sure you cleanse yourselves after cleansing the house. By showering and visualising any negativity being washed from your physical body and down the drain. Or if you prefer, take a bath with a couple of tablespoons of Epsom salts or rock salt dissolved in the bath water.